In just a few weeks, I will be crossing off an item on my bucket list I’ve been wanting do for a long time – riding Royal Enfields through the Himalayas. 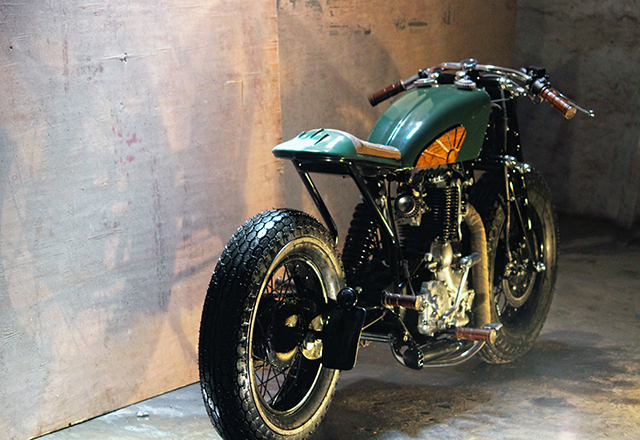 Fittingly, the ride starts in New Delhi, India, where the builders of today’s Enfield café racer are based. 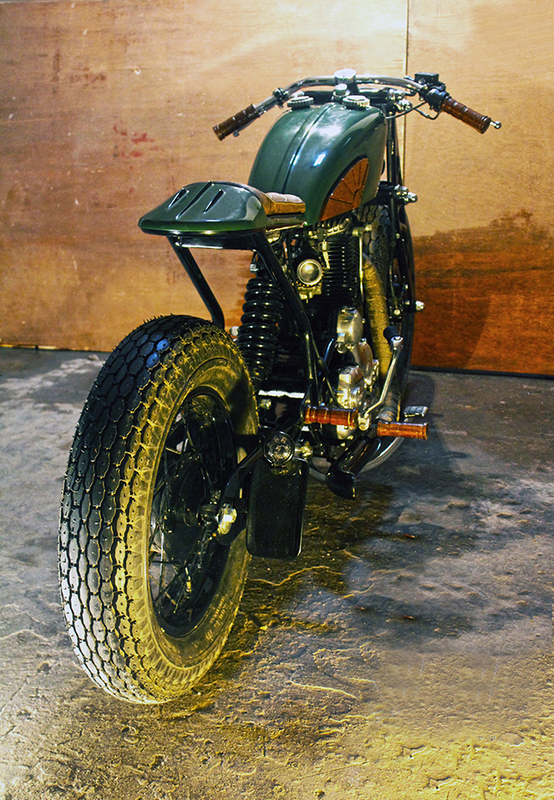 Bull City Customs have been building bikes in one of the most populous cities in the world for around three years now. Obviously the locals love their Royal Enfields – they’re pretty much a national treasure there and a company they are very proud of. 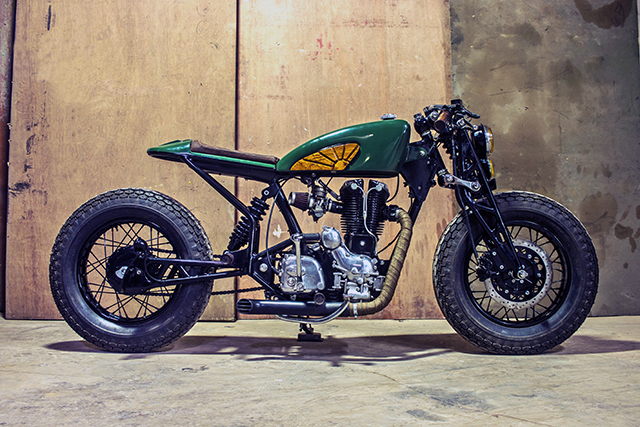 So when a customer approached them to build a café racer with a touch of brat using an Enfield engine they couldn’t wait to get started. As luck would have it, the guys at Bull City had a ‘Brat Café’ design that had been floating around in their heads for quite a while. “It was like a divine intervention” says Reginald from Bull City. 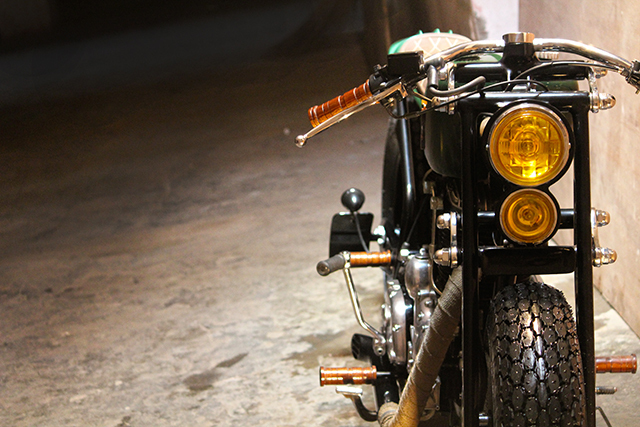 Even though the customer was from India, he had never owned a Royal Enfield but was keen on owning an older model. “We knew some older RE engines can be difficult to get accustomed to, so we took up the task of hunting for an appropriate model for this new RE enthusiast” he says. As luck would have it, they got their hands on a Royal Enfield 350cc Machismo 2004 with a 5 speed gear box that was up for sale. It wasn’t as old as they originally wanted but would be a more reliable ride for the customer. The other good news for the build is that this particular model didn’t require a battery and had a lot less wiring than other Royal Enfield models. After finding the appropriate donor Enfield with an AVL Engine the chassis design got clearer in the Bull City team heads because they didn’t have to worry about any electrical boxes or battery box cluttering the chassis structure. Once they were done chopping the stock chassis frame they had ample space to create a new frame to give the bike a more aggressive stance. One of the most unique features of the build is the combination of rear mono shock suspension with and old school girder front suspension. “We embarked on starting the girder suspension as soon as we put our thoughts down to the artwork for this design” they say. “We added a modern take to this girder by replacing the suspension springer with a monoshock, thus putting our Bull City style stamp on it.” The construction for the girder frame turned out to be a welding nightmare for the guys and the most time consuming aspect of this build due to the links added to give it that modern look. The swing arm was fabricated with twin pipes to add detail and to continue with the modern girder design look. One of the features that the customer insisted on was the 16 inch Coker tires. 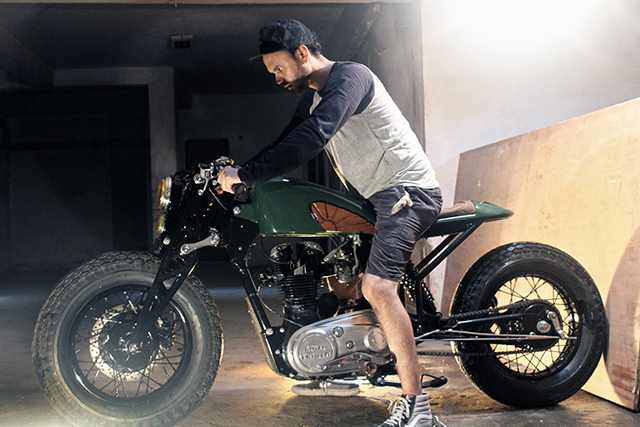 “They were something Sudeep insisted upon and we loved how they just fit into the overall aesthetics of the build.” The free flow exhaust system was also requested by the customer because he “wanted the bike to be heard from a mile away”– and Bull city couldn’t have been more happy with that request. A little detailing was added to the tip of that exhaust to complete that old school feel. 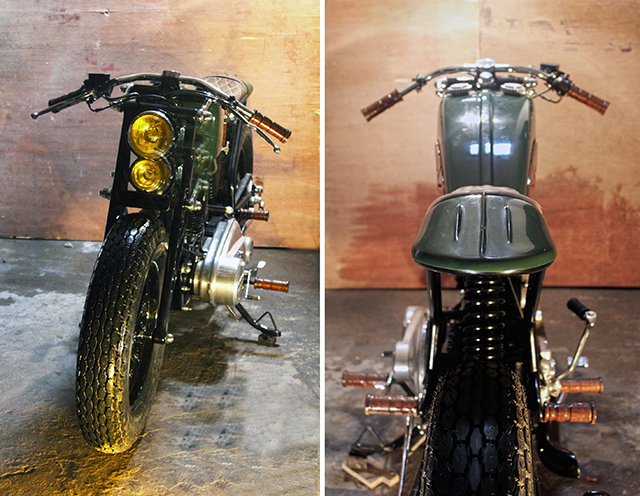 Another stand out feature of the bike is the twin head lights. They managed to source a 6 inch and 4 inch head light which lined up perfectly. The lights had to be constructed into a single frame, to be able to nestle all the wiring. So they moulded out a compact rear light casing and a holder to settle on a single mount for the girder. 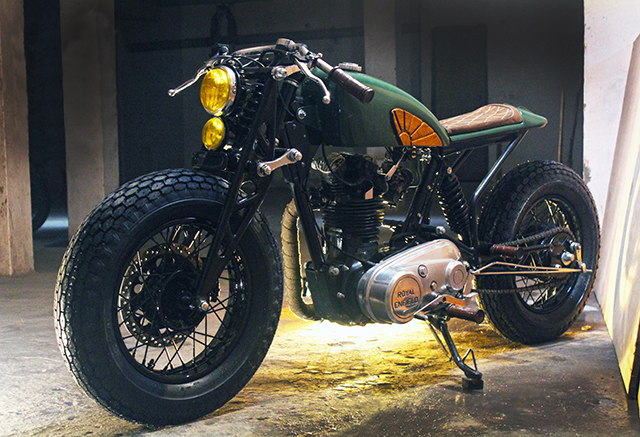 Bull City Customs have created a truly unique Royal Enfield café racer with a distinct Indian touch and the customer couldn’t be happier. It may not be to everyone’s taste, but you have to hand it to these guys for the level of skills and craftsmanship. 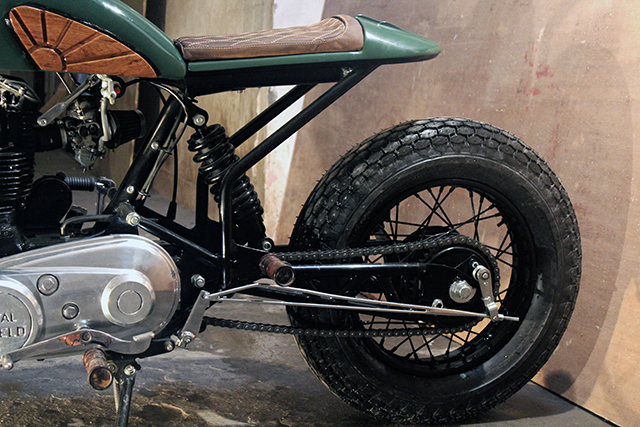 We look forward to seeing what these guys create next – we also look forward to dropping into their Delhi workshop very soon! If you want to cross ‘riding the Himalayan mountains’ off your bucket list, you can find some epic rides coming up through our friends at Himalayan Heroes. You only live once.